Conditions were perfect with the sea as flat as a little mountain pond. The father and son were with us again for day 2 of their fishing adventure. 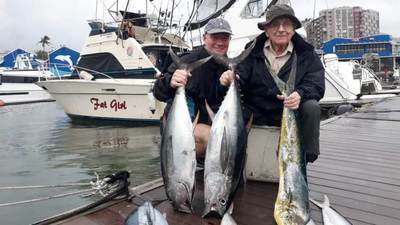 Grand dad (92) got to fight some more fish and landed himself and awesome Yellowfin Tuna and some Dorado. All in all the fish was good even though we had to look hard to find some fish we managed to get another Grand Slam, and so a Grand Slam 2 days in a row with the same awesome guys. 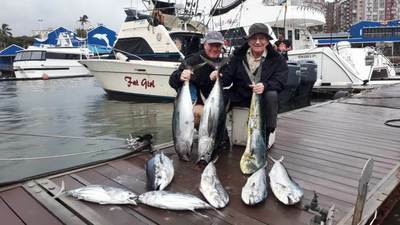 This time the tally was 4 Dorado, 3 Yellowfin Tuna and 2 Oceanic Bonito.